Acaciosa is one of perfumery’s greatest floral perfumes. It was released in 1924 and remains one of the most beautiful, lush jasmine and rose fragrances ever. In Bottle: A big floral bouquet of jasmine and rose with a slight hint of amber. Applied: Jasmine and rose are the stars here and the major players throughout the entire fragrance. The instant Acaciosa is applied you will smell these two principle notes that have endured the test of time and have continued to appear together in some of the fragrance world’s most popular classics and contemporary fragrances. Acaciosa does jasmine and rose proud because it plays up their authentic beauty and blends them together so well that a sniff of Acaciosa tells you immediately that you’re smelling a fantastic floral. There’s no real debate to be had, you’re smelling history and you’re smelling a floral perfume as it should be. Right from the start, into the middle, and down into the base you get jasmine and rose mingling together in a gorgeous medley. There’s a faint hint of sweetness and a jolt of tart pineapple that serves to deepen this fragrance with its mostly heady floral bouquet. The base intensifies with a warm amber quality. This amber note is present during the opening and midstages but doesn’t become too strong until you reach the base. Extra: Caron has a fountain version of Acaciosa available for those of you who wish to experience the full on artistry of this fragrance. One of these days I’d like to see a Caron fragrance fountain for myself. Design: The bottle pictured above is from a vintage ad dating back to the 1930s when Acaciosa was a bit easier to find. It’s a shame this fragrance is so exclusive now. I have yet to hold or even see more than a small sample of this stuff but everything Caron made back in its hey day looks beautiful. Notes: Orange flower, pineapple, jasmine, rose, amber. I have no idea and no way to tell how old the decant of Acaciosa I have is. We can only take a blind stab in the dark that it is a vintage that could have been from the 40s, but even then we can’t be quite sure. So take the dating of my sampler with a grain of salt since I can’t guarantee its accuracy. 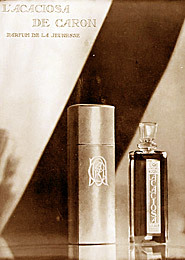 Reviewed in This Post: Acaciosa, ~1940, Parfum. This entry was posted in caron, classic, floral, Reviews By House and tagged amber, jasmine, orange flower, pineapple, rose. Bookmark the permalink.